Our zip-line canopy tour consists of many treetop sky towers, zip lines, suspension bridges and a cargo net located at the top of a Southern Pine Forest. Our experienced guides will lead you through the tour for a fun-filled adventure that anyone can enjoy. No experience is necessary! 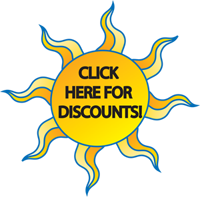 Anyone from 50-250 lbs can enjoy Ocoee Canopy Tours. Looking for the aerial equivalent to Ocoee river rafting? Check out Raft One’s canopy zip-line tour! Our canopy tour is the only place you can get a bird’s eye view of the beautiful Cherokee National Forest and Blue Ridge Mountains. 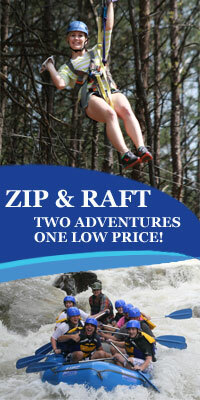 Pair a zip-line tour with one of our Ocoee rafting trips and get a discounted rate on the combo. Raft One provides you with all the equipment you need for ziplining including helmets, full body harnesses, trolley, gloves and 2 safety lanyards. Ocoee Canopy Tour is the first real canopy tour in North Georgia and Eastern Tennessee. Located in the Cherokee National Forest, our zip-line tours have views that can’t be beat! The staff at Raft One and Ocoee Canopy Tours is trained under the highest standards to ensure that you have the best experience possible. As top-rated outfitters on the Ocoee River, you would be hard pressed to find guides who are more passionate and knowledgeable than ours. Our outpost is conveniently located 10 minutes from Blue Ridge, Ga., and an hour and half from Atlanta and Knoxville, which makes zip lining a fun weekend adventure anytime. Contact our staff to book your Ocoee zip-lining tour today!